In a world where celebrations of anniversaries are two-a-penny this new release from Stile Antico marks the centenary of an important institution by celebrating one of its most significant achievements, which it is easy to overlook. The institution is the Carnegie UK Trust, established in 1913. The achievement in question is its support for the publication of Tudor Church Music (“TCM”). Between 1922 and 1929 the Trust financed the publication by Oxford University Press of ten volumes of TCM, which was a collected edition of church music, most of which had never been published previously in decent modern editions. The original intention was to publish twenty volumes but the Trust was obliged to call a halt halfway through due to delays and financial losses. All this information, and much more, is contained in Matthew O’Donovan’s excellent booklet essay. In another change R.R. Terry, the celebrated director of music at Westminster Cathedral, who was to have been the editor of the project, was unable to fulfil the brief and was removed. As Matthew O’Donovan says, the project, even in its truncated state, was a major undertaking and one which “was to transform the musical life of the whole nation to a degree which could not have been anticipated at the time.” In large part this was because many of the pieces were also published separately in octavo form. In this way they became readily available to choirs up and down the UK - and, in time, further afield. Though O’Donovan doesn’t use this precise term, TCM effectively set the agenda in terms of repertoire for the singing of Tudor music for the next fifty years or more. The musical appetite that TCM satisfied can be gauged, perhaps, from the fact that between 1922 and 1930 the most popular piece in the octavo editions sold over 16,500 copies. That piece was Byrd’s Ave verum corpus and it’s fitting indeed that this should open Stile Antico’s programme, which comprises a selection of the music that was included in TCM. It’s fitting also that Byrd’s exquisite piece should receive a very fine performance, one which is beautifully balanced and controlled and in which Stile Antico sustain the line expertly. They’re just as successful - and for largely the same reasons - in Byrd’s Five-part Mass, the movements of which are interspersed throughout the programme. As well as displaying the aforementioned qualities, these fine young singers make Byrd’s writing come alive - as they do the rest of the music on this disc. For example, they bring an admirable forward momentum to the outer sections of the Gloria and Credo, though never at the expense of the sense of spaciousness that this music needs. The Credo is particularly fine throughout and I also admired greatly their spacious, dedicated account of the Agnus Dei. As will be seen from the track-listing, this programme contains some splendid examples of Tudor church music. The two Tallis pieces are very well done, in particular the extraordinarily intense music of In ieiunio et fletu which is sung expertly and with fine feeling. I’m sure Matthew O’Donovan is right to suggest that this was a musical metaphor for the difficulties of the English Catholic recusants in the reign of Elizabeth I. Equally admirable are the performances of the two offerings from Robert White. In the Psalm-motet, Portico mea Stile Antico provide an excellent contrast between the sections for full ensemble and those where White writes for a handful of voices. Their performance of the earlier Compline hymn, Christe qui lux es et dies is marvellously atmospheric. The Morley and Gibbons pieces come off well and it’s intelligent programming to offer two highly contrasting works by Gibbons. The programme culminates in one of the most opulent examples of Tudor polyphony: Taverner’s O splendour gloriae. Like most Tudor pieces, we don’t know the date of composition but it must date from the reign of Henry VIII (1509-47) who, whatever his failings, was something of a Renaissance man and encouraged high art. Taverner’s piece is confident, very ambitious and is conceived on a grand scale. The writing is often rich and complex. I admire the way this Stile Antico performance builds in fervour from relatively simple beginnings to the magnificent, extended ‘Amen’. This piece is a masterpiece of polyphonic invention and receives a performance fully worthy of Taverner’s inspiration. 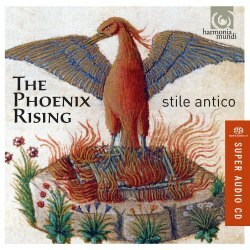 I’ve heard most of Stile Antico’s previous discs and this latest one is most definitely up to the very high standards set by their earlier releases. The twelve singers - here augmented in a few items by one or two colleagues - always perform without a conductor yet such is the assurance, unanimity, flow and architectural grasp of their performances that one would never know they are not under the guiding hand of a conductor. Clearly this is all the result of scrupulous preparation. The singing itself is well-nigh flawless and the sound this group makes is a constant source of pleasure. As usual from this source production values are very high. The recorded sound is excellent - I listened to this hybrid SACD as a conventional CD - while the booklet is beautifully produced. This recital of glorious music, superbly performed, is a notable centenary celebration of the Carnegie Trust.